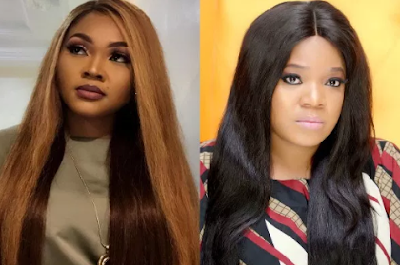 Over the weekend, Toyin Abraham called out fellow actress, Mercy Aigbe on instagram saying she contributed to her marriage collapse and gossips a lot. People where shocked over the allegations and Toyin later deleted her claims. Later she claimed it was a publicity stunt, but Mercy kept mute in all of these. Toyin again took to her page, to call Mercy Aunty, saying she loves her too much and can never disrespect her, Mercy still kept MUTE. Now fast forward to this morning, Toyin Abraham’s ex-husband, Niyi Johnson has been celebrating his new girl, Seyi Edun who is a year older today on IG and Mercy joined the train. Not only Mercy, Mercy’s BEST FRIEND, atleast for now, Mide Martins has also liked a video Niyi posted about Seyi. Infact, Mercy went all out, she took to IG to post Seyi’s photo on her page wishing her a happy birthday (something she never did, when she and Toyin were best of friends). In fact she stayed off Toyin and Niyi's drama. But now, it seems Mercy doesn't care anymore, and has thrown caution to the wind. Recall when Mercy and her estranged Hubby had their own differences, Toyin Abraham came all ot to stand by her. She posted her photo expressing how in love she is with her. Hehehe,hopefully these whole drama thing will stop. And hmm,let's not also forget how they said Omoni Oboli started it all with her newest movie. Was Omoni wrong inviting her Yoruba colleagues? Lol,we know some people are right there nodding saying yes.Wicked people,she wasn't wrong, lol. » Trailer: Toyin Abraham, Chris Attoh, Ngozi Nwosu & More Star In "The In-Laws"